Our first year of blogging….we had about 1,000. It’s been such a great journey. ….and one that we don’t plan on stopping anytime soon. As long as we are living our lives in the Cavender house, I’ll be taking pictures and writing about it. Congratulations! I love reading your blog and am so glad I found it. I’m glad I found you, also! I don’t really remember how or when, but I have been following for awhile. The writing is superb and I think you should consider a book. A book????? Really? That’s a great idea….but you know, you can read it all hear for free…..
Awwww thanks Kathleen, we can’t stop now..there’s still so much to do to the house..
Congrats. You really are my favorite bloggers. I have told many to check it out. Glad to hear you will keep chugging along. Great job. Awww shucks Tracie (look’s down and kicks dirt) Thanks for sending people our way. I’m so glad I found you’re blog!! I look forward to reading about your adventures! I just know we would be great friends!! I love everything you do!! Just like everyone else, so glad to have found your blog! I love your house, and enjoy watching the process of your renovations! Can’t wait to see the finished bathroom! Take care. Thanks to you stumbling onto my blog, I read yours now and congrats to your milestone. As long as you continue to post, I will continue to follow. 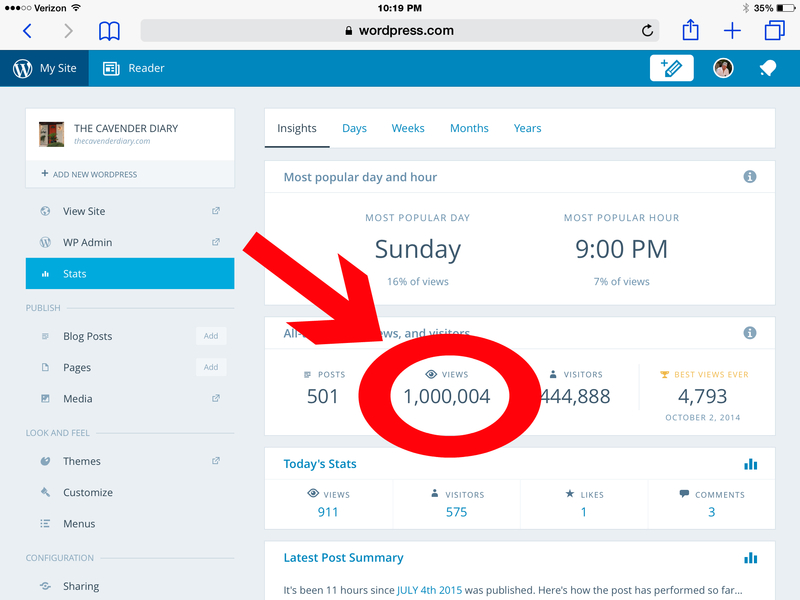 It’s no surprise you have 1 million read posts, you always put a smile on my face and give great ideas and tiips for projects. I wish you many more years of blogging, even after the house is finished. Thanks Allison, One day, this house just may be finished…..not anytime soon though, so don’t fret. Harley Davidson is currently lying under my desk licking the sore foot that she isn’t supposed to be licking or she gets the “Cone of Shame”. She sends her love…..
Congrats to my favorite bloggers!!! !